230 pages | 34 B/W Illus. 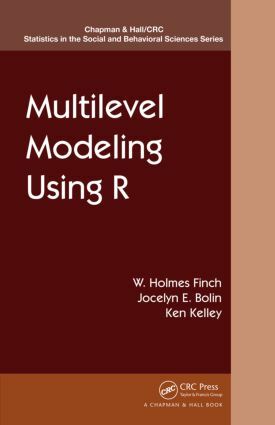 "… it could help someone transitioning to R from some other software to analyze data as they were accustomed. It is easy enough to find very specific things in the text …"
Basic Linear Models. Two- and Three-Level MLMs for Continuous Outcomes, MLM Applications for Longitudinal Designs and Dyadic Designs. MLMs for Dichotomous Logistic Regression and Separately Ordinal Logistic Regression. MLMs for Other Generalized Linear Models. W. Holmes Finch is a professor in the Department of Educational Psychology at Ball State University, where he teaches courses on factor analysis, structural equation modeling, categorical data analysis, regression, multivariate statistics, and measurement to graduate students in psychology and education. Dr. Finch is also an Accredited Professional Statistician (PStat®). He earned a PhD from the University of South Carolina. His research interests include multilevel models, latent variable modeling, methods of prediction and classification, and nonparametric multivariate statistics. Jocelyn E. Bolin is an assistant professor in the Department of Educational Psychology at Ball State University, where she teaches courses on introductory and intermediate statistics, multiple regression analysis, and multilevel modeling to graduate students in social science disciplines. Dr. Bolin is a member of the American Psychological Association, the American Educational Research Association, and the American Statistical Association and is an Accredited Professional Statistician (PStat®). She earned a PhD in educational psychology from Indiana University Bloomington. Her research interests include statistical methods for classification and clustering and use of multilevel modeling in the social sciences. Ken Kelley is the Viola D. Hank Associate Professor of Management in the Mendoza College of Business at the University of Notre Dame. Dr. Kelley is also an Accredited Professional Statistician (PStat®) and associate editor of Psychological Methods. His research involves the development, improvement, and evaluation of quantitative methods, especially as they relate to statistical and measurement issues in applied research. He is the developer of the MBESS package for the R statistical language and environment.